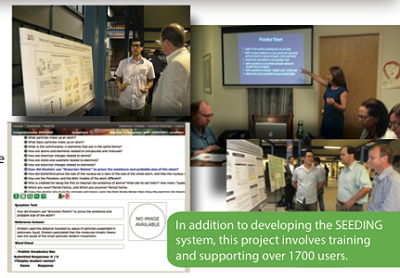 We are conducting research in conjunction with collaborators to help instructors assess student knowledge and skills in real-time (Comprehension SEEDING; Nielsen PI, IES $1.83M 2011-2014 with ASU and UCD). 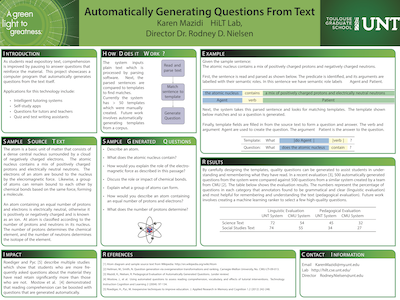 Students submit free text responses to instructors' open-ended questions via mobile devices to an NLP system that clusters the answers and provides the instructor feedback on the types of misconceptions and their frequency, among other things. 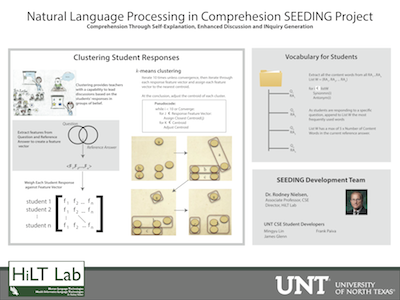 Unlike clicker technology, students must articulate their understanding of a concept, which has been shown by numerous cognitive science researchers to be a key to deep learning. This research will benefit from aspects of Dr. Nielsen's Ph.D. work, which was the first research to successfully assess elementary students' one- to two-sentence constructed response answers. 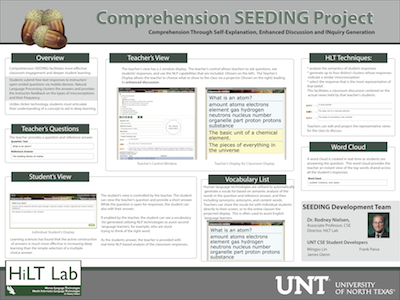 The Comprehension SEEDING Project is currently supporting science classes with more than 1700 users using on a weekly basis.